Perhaps my broadest summary of this is here. You’ll see that the concept of a people being called in order to bring blessing to all mankind stretches right back even beyond Abraham, into the early chapters of Genesis, through the strong parallelism between Adam and Israel. When regarded through the lens a biblical theology whose writing was overseen, finally, by the Spirit of Christ (1 Pet 1:11), then Adam, Israel and Christ become more strongly united as parallel figures in a universal divine vision for mankind. More than that, it is a vision (in fact) of an entire new creation, which we see summed up in Revelation at the end of the Bible using the imagery of Genesis 1-3 at the beginning of the Bible. From another perspective, we begin to see the theme of the whole Bible as the new creation, almost presupposing rather than describing the old. To those accepting an old earth chronology, that is somewhat axiomatic: the events of the entire Bible take place over the last few thousand years of a history of several billion. Those billions are not unimportant to God – but they are subordinate to the intentions of the Holy Scriptures, which are our salvation, not world history as an end in itself. And so in the text Adam is newly offered living fellowship with God, eternal life and dominion over even the angels in Gen 2 (cf Ps 8), and his failure triggers God’s plan not only to bring salvation from sin and the defeat of evil, but the completion of what Adam failed to achieve, which the prphets and the NT call “the new creation”. This salvation is first enacted through Israel, and then, after Israel’s recapitulation of Adam’s failure, in the work of God himself through the Incarnation of Christ. It’s an epic tale, needing a volume at least to do it justice (we might call that volume “the Bible”, I guess!). One consequence of this approach is that it makes it more plausible, and even likely, that the writer of Genesis always intended Adam to be viewed not as a man living alone in the world until Eve was created, but as a man taken from, and representing, the existing human race whose creation is merely sketched, like that of the rest of the universe, in Genesis 1. This man would be transformed by his calling into the garden, and by relationship with God, and perhaps by a change in his nature too (though these may amount to the same thing, since to know God is to be transformed). Either way, the specialness of his calling accounts for his need for an equally unique wife. In another post I explored this in terms of anthropology and the ways peoples, especially ancient peoples, describe humanity. Often their names for “man”, and their myths, speak as if that particular tribe were the only race of men, when it is quite clear that they must have been aware of other human beings. I mentioned in that post the ethnocentricity of ancient Sumerian texts, and that they referred to themselves as “the black-headed people”, and I’d like to expand on that now. 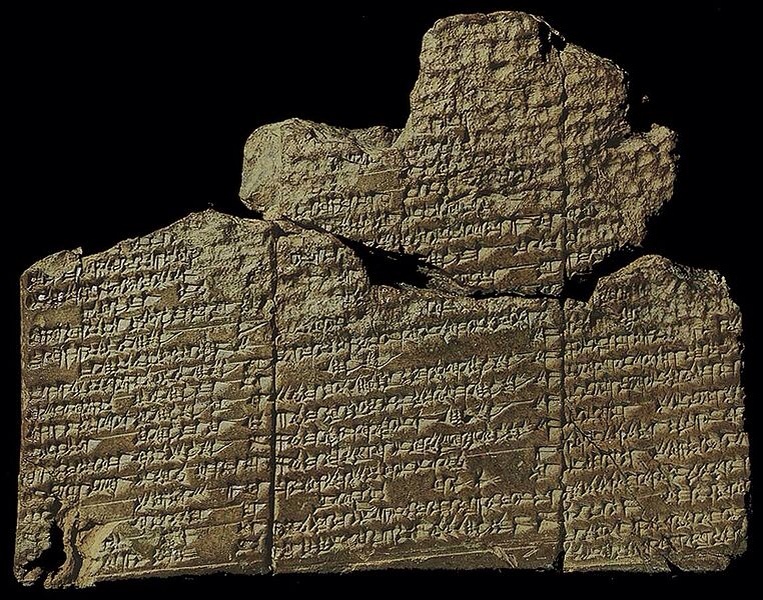 The closest ANE literary parallel to Genesis 1-11 is the so-called Eridu Genesis, taken from a (broken) Sumerian tablet of c1600BC, but thought probably to have been composed c2300BC, making it the earliest known narrative text in the world. It speaks of the creation of mankind (but see below), and after a gap in the text, of the Great Flood that probably dates to around 2800-2900BC. In other words, it is quite likely to preserve a traditional account of the Flood passed down orally since the event (and in all likelihood altered somewhat in the way folk-tales are). I’m not concerned here with any literary, or even historical, connections between this narrative and Genesis, but only with the facts that (a) it’s close in time and place to the origin of Genesis and (b) it, like Genesis, describes the creation of man by divine beings. Then a large part is lost; “perhaps a story of a failed attempt to build a city,” before it goes on to describe the descent of kingship from heaven, the first cities, and the flood narrative, with King Ziusudra taking the part of Noah. Now the text, as I have said, is Sumerian, and the Sumerians were the first known immigrants into Mesopotamia, who called themselves “the black-headed people”. But already by 2300 BC, the earliest likely date for the written story, there was another people group in the land, the Semitic (anthropological, not Noahic, sense) Akkadians from Anatolia. In fact, that date marks the height of the power of the Akkadian Empire under Sargon the Great, and the start of the eclipse of Sumerian as a living language. But Akkadian as a language had been spoken, and known in Mesopotamia, for centuries beforehand. And that is self-evident really, because even before the Semitic people began to live alongside the Sumerians, they would have been near neighbours. The Sumerians also are known to have traded for products from the Indus Valley civilization. There has never been a continental people-group that wasn’t aware of their neighbours close at hand, probably waving spears at their borders, and at least of rumours of strangers further afield. And yet the Eridu Genesis speaks of the creation of the “black-headed people”, along with the animals, as if they alone inhabited the earth. If absence of evidence is not evidence of absence in the case of the Eridu Genesis, then one needs to supply a solid set of reasons why that should not also be the case for the description of creation of adam Genesis 1, or of “Adam” the individual in Genesis 2. Genesis describes how adam was created, as Eridu Genesis describes how saggigga (the black headed people) were created – it does not entail that no others were ever created, nor even that the writer was unaware of any. The silence is a matter of genre, or if it is not, then an explanation that applies to Genesis but not to Eridu Genesis need to be given. It is generally accepted that there is an etymological link in Hebrew between adam, man, and adamah, “red soil”. Even secular sources agree that this has to do with the creation of man as a tiller of the soil in the Hebrew narrative. Incidentally, whatever the exact link to agriculture is, that makes putting ones Adam back into the mesolithic or palaeolithic problematic: man would have to be created to till the soil, but not actually learn to do so for millennia. Both etymology and the text itself speak of adam as from the soil, for the soil, and returning to the soil. This much is seldom disputed. What seems less remarked is that, as far as I know, the words for “man” or “mankind” in other languages, and notably those geographically related to Hebrew, are not derived from the word for soil. I stand to be corrected by any ancient lingusists here, but this etymology appears to be a particular feature of Hebrew, just as “black-headed people” (saggigga) was peculiar to the Sumerians. The etymology is so closely linked to the narrative of Genesis that it seems likely the story came before the language. And this is by no means impossible, because the Hebrew language arose only after Israel’s settlement in Canaan – if the ancient narratives were handed down through Abraham and the other patriarchs, it was in a language that preceded Hebrew, and helped to form it. This to me suggests that adam may well have a risen as a specific name for the culture from which Adam came, or of which he was considered the progenitor, which became generalised to the whole of mankind as the Hebrew language developed… and for good reason, if Adam was also the progenitor of an entirely new kind of man, sometimes known nowadays as Homo divinus, whose spread is represented in the Table of Nations of Gen 10. And that spread is unique in ANE literature – no other nation even attempts to show not only the creation of itself, but the dispersal of its seed to form many nations. If, in this way, adam were originally to be as specific and local a term as saggigga, it does not imply, any more than in the latter case, that it was intended to imply that no other men existed, nor indicate that the writer was unaware of them. The example of the Eridu Genesis is clear evidence that other peoples could, and did, describe the creation of their own races, even with their own fauna, whilst being fully aware that others humans and animals existed in the world. The bottom line is this: if human universalism is to be found in Genesis (and I believe on several grounds it is, and it is good evidence of the divine origin of Scripture), then the intuition that whoever first composed those early chapters must have been aware of a widepread humanity is probably also an implicit part of the text. It follows that the Hebrew writer probably had some idea of how the problem of Adam’s sin, and the solution of the calling of Israel, came to apply to a worldwide and relatively ancient human race. Once again, something like the Genealogical Adam hypothesis appears to be implied by Genesis itself. This entry was posted in Adam, Creation, Genealogical Adam, Science, Theology. Bookmark the permalink. 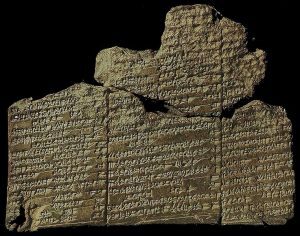 14 Responses to Genealogical Adam – an observation from Eridu. I need to add that Gregory cannot (and should not) be read within an evolutionary debate, for obvious reasons, no one would have discussed this thing during that time. oops, I cannot change thing,,, the quote should include this …..
….. is fitting for God not to regard any of the things made by Him as indeterminate, but that each existing thing should have some limit and measure prescribed by the wisdom of its Maker. I agree that the Cappadocian Fathers should not be lightly disregarded in their interpretations. I also agree that the Fathers, or even later theologians, should not be brought in to arbitrate either on evolution, or even the age of the earth (a far more scientifically secure matter). It would be as foolish to find patristic passages supporting geocentricity (and there are some) and take them as authoritative expositions rather than cultural assumptions, or to take Aquinas’s acceptance of spontaneous generation of life as somehow binding on science. Still, it’s interesting how they can, when fairly treated, cast much light on the matters in hand – or, as here, on how the Church has worked with Scripture in the past. Gregory is clearly regarding Gen 1 as explaining “the existence of mankind” in a kind of “atemporal” and universal way, rather than as a description of how the first man or men appeared. By extension, it would seem he would also need to view the whole creation account in that way, not just adam: “This is how God created the-world-as-it-is-throughout-space and time” rather than “This is how God started off the world.” Right or wrong, it’s a lot more subtle than Creationist “historical literalism”, very much a product of Enlightenment rationalist patterns of thought. Gregory’s is an insight I may need to consider more seriously than I have: as you may have picked up along the way, my current view is that Gen 1 is about “the phenomenological world”, ie the world as it appears to a simple observer (so far, so Gregorian), but that the lens used by “Moses” to view that is that of temple imagery, leading overall to the idea that “God created the world as it is as his temple” (earliest source for that part is the infamous Cosmas Indicopleustes). The first approach (given deep time and archaeology) leaves the question of “man before Adam” completely unaddressed, which is fair enough but makes any links we attempt between “early mankind before Eden and sin” and “sinful man in need of Christ” forever speculative. Adam starts the ball rolling, but how is all mankind in the Americas or the Andaman Islands, or in palaeolithic caves, implicated? Gregory seems to be taking the text philosophically, in line with his times. The second approach might provide some biblical answers to those questions, and in this post (and some others) I’ve been making a mainly exegetical case that “Moses” from the start saw Adam as the representative of “all mankind” of his time, as well as the archetype of Israel’s ministry towards mankind of their time. I’m taking the text more narratively than Gregory. To make a nod to Mark’s comments here, I believe either approach can take into account the christological concerns of Genesis. I am inclined to take a more cautious view of mankind, past species, and Adam. By this, I mean I take (say) Gregory’s discourse, to focus more on what it means to be human, and Adam as that first human who communed with God. Gregory speaks a lot more on Christ, what Adam and Eve may have been before disobeying God, and what God the Father created through the Word of God. I find it difficult to extract, so to speak, a narrative that may be used within an evolutionary context, for what I regard as obvious reasons, no one discussed evolution. The outlook that seems reasonable to me is that the Patristic writings rely on God’s foreknowledge, and since fallen man was to multiply, God ensured that humanity would do so, after Adam and Eve were remove from the garden and communing directly with God. Thus Moses and other writer, imo, were interested in genealogies that traced from Adam, to Abraham, to Israel, and the gospel shows this culminated in Christ. This by far outweighs any interest in what and who may have been around – although the text seems to me to assume other people were around when that became relevant to the Biblical narrative. You’re right about “narrative in an evolution context” – but contra the claims of drnmud I’m not primarily interested in evolution, but more in the history of “modern humans” that’s available to us, and some of which was available to the writer of Genesis. As a matter of faith (and I include the faith of the simple believer who neither knows nor cares about big issues) it’s enough to know that we were in Adam and we may be in Christ. But for better or worse, knowledge of all kinds compels us to ask how we got to be in Adam, and to refute those who claim that not all are (witness the slavers and others of former centuries). My point was to show that orthodoxy is comfortable with Gen 1 referring to mankind, and the emphasis on “truly human” is obtained from biblical teachings, so your comments are sound. But for better or worse, knowledge of all kinds compels us to ask how we got to be in Adam, and to refute those who claim that not all are..
… and I agree that matters such as Adam and origins have been a point of contention (eg biologos) and some seem to make these focal points of their faith. This is both unfortunate and unnecessary, but there it is. I guess I would (wish or) like to see discussions on how all of humanity is created by God to receive His Grace and this can be understood from Gen-revelation, and without discord from scientific insights. If this were so (???) than all the arguments can be theists vs atheists (smiley intended). Atheists? Oh yes, I remember atheists. A big thing 10 years or so ago – still a few hanging on at BioLogos, I see! –	The race of humans (which preceded Adam by 200,000 years according to science) was so un-special that none of their human representatives had a relationship with God for a couple thousand centuries. The other questions are old ground I’ve covered many, many times. That last one I addressed head on in a much-commented post just a week ago, and I don’t intend to do so again here. But if you’re really interested in the question of “un-special”, consider the historical Christian doctrine of grace. If Homo erectus, say, had some rational spiritual awareness of God and worshipped him at a distance in a way that a chimpanzee cannot, but was not given the nature, by grace, for intimate fellowship with him, nor for rule over the angels, nor for eternal life, then he would still have been a very special creature, blessed in his way and bringing glory to God. So is the irrational chimp blessed, actually – for all God’s creatures reflect, and receive, his goodness in their own degree. This would be true for Homo erectus even if scientific chronology is entirely false and he lived alongside Adam. And if the same were true to a higher degree for Homo sapiens before Adam, where would be the injustice towards such a creature of the earth? If Adam was made – whether by calling or by some supernatural change in his essential nature – suitable for divine relationship, co-regency and eternal life, then that is amazing grace for both him as well as his race (“What is man, that youy are mindful of him?”), but it is no injustice to the rest of creation, especially since his calling was to bring the whole of the cosmos into God – a future we can even now barely glimpse through Christ, the second and true Adam. Before Christ came, people were people like us, but only the Jews had received the words and covenants of God, for “salvation is from the Jews”. Worshipping Minerva or Odin or Brahma doesn’t provide true relationship with God, or if it does the preaching of the gospel was for nothing. But hearing and receiving Christ – whether as an individiual, a nation, or even a species – is nothing to do with being special and everything to do with God’s sovereign grace. Ann Gauger, a Catholic IDist and believer in historical Adam as the sole progenitor of humanity, read my previous post and commented on BioLogos that I’d neglected that “with God, a thousand years is as a day.” I’d deny that, but she’s right that, given God’s apparent “slowness” in history, leaving mankind in sin for 200,000, or even 500,000 years would be his sole prerogative. But I don’t see it that way: to leave hominins as hominins in innocence and natural reverence is grace. To call Adam as vice-regent of creation is more than grace – and how few sons of Adam today are there who appreciate, or even accept, that astonishing, astonishing gift? And even if scientific chronology is entirely false and Homo erectus lived alongside him, Adam would still have been formed from dust and not from Homo erectus. But I shouldn’t be putting words in your mouth. I would agree that, in our fallen world, a significant portion of humanity appears to be lacking God’s sovereign grace and a relationship with God in the Judeo-Christian sense. But that doesn’t mean such was always so. I believe that, before the fall, all of humanity had God’s sovereign grace and a relationship with God in the Judeo-Christian sense. But also that “all of humanity” added up to only two people. Genesis says that when God completed creation with the crowning of man, He called it “very good.” I don’t think, and I don’t think God would think, that “very good” would include establishing from the very start virtually all humanity lacking in God’s sovereign grace and a relationship with God in the Judeo-Christian sense (and for the next 200,000 years). And I think that’s why “it” never was. Possibly off thread relative to your main points but a few notes. I wouldn’t see the sumerians as immigrants. Instead they spoke one of the languages of Ham and were surrounded by those speaking languages from Shem. All languages just twisting from the original at babel. so the Sumerians are from ham and probably from Cush. nimrod and all that. which means they are the same people as in cush/Ethiopia in Africa. So the first intelligent civilization was the same people as the blacks in that part of africa. only climate being a origin for colour differences. this is historical interpretation in evangelical scholarly circles. Interesting point about about Adam. He did not seem to know a woman was coming. He did seem to be looking at animals for companionship. yet since he would see male/female in animals it suggests that he didn’t anticapate a female body type . why? Is it possible he could se;f reproduce?! he knew this. SO when god made him sleep and took the rib it was not a actual rib but a reference to reproductive organs. so making the woman from this. The word rib in genesis, I understand, doesn;t have to mean a bone of the ribcage. Woman was only made for to stop mans loneliest. Otherwise, possibly, everyone would be men. Woman was not made for reproduction it seems. Hi Jon — long lost prodigal merv popping in here for some long overdue interactions. First of all, thanks for the continued education! I really appreciate all your scholarship and how the “crumbs” falling from your table benefit others of us here. Any future etymologist correction notwithstanding, it was interesting to learn that the meaning of “earth” or “soil” for “Adam” is a unique Hebrew feature. I find that fascinating for some reason! I may digress to more generalities here closer to my own level of discourse and perhaps reacting some to other commentors here as well. But I’ve been enjoying sermons lately from a pastor this side of the puddle who just completed a series on “comparative religions” where he spent a sunday each on each of the world’s major religions. At the beginning of the series he shared that one of his parishioners approached him in the foyer and told him flat out: “paster, why are you even preaching about all these other major religions? I don’t need to know anything more about them beyond that they are going to hell, and that Christianity is the only answer we need to learn about.” So the pastor explained at the beginning of the series that a huge fraction of the world’s peoples (our friends and neighbors) adhere to one of these major traditions. If we are to obey Jesus command to love them, then we are obligated to reach out and learn about them and their beliefs so that we can better understand how we can love and build relationships with them. And beyond that, I hope that when you examine what some other major religions teach, and where that intersects (as well as where it fails to intersect) with Christianity,that you will come away with a better understanding of why you believe as you do. None of apostles (in their better moments) despised a gentile culture so much that they would bring it under Christ. Even idolatry such as what Paul carefully studied in Athens became a tool in his hand to proclaim “the unknown God” to them. Of course there were points and traditions within their cultures that would need to be challenged and changed; but their traditions at large were never bluntly just repudiated at large. So I thank you for helping me (us here) understand our own faith better, by understanding the world better in which God worked to bring to fruition his blessing to all the nations! It seems to be soundly biblical teaching to see the echoes of this blessing called forth in the repeated themes all through the scriptures — beginning even with Adam. None of apostles (in their better moments) despised a gentile culture so much that they would **fail to** bring it under Christ. I omitted that important phrase: “fail to” the first time! Thanks for these comments, Merv. The relationship in both Scripture and Church History to “other religions” is interesting and nuanced, indeed. On the one hand, Paul is distraught at the Lycaonians’ superstitious worship of him and Barnabas, and pleads with them to turn from these “worthless things”, but on the other he loves them enough to plead with them, and respects the natural religious motivations behind their error as the basis for that pleading. In the contemporary situation, it should not faze us to find ethical and even theological truth in other religions, whilst having no illusions about their falsity. In my own current thinking, “natural religion” (true but very limited) is a Genesis 1 creation endowment, true relationship with Yahweh and spiritual enlightenment the fruit of the Genesis 2 revelation, and today’s false religion the result of the sinful perversion, over millennia, of a mixture of both.